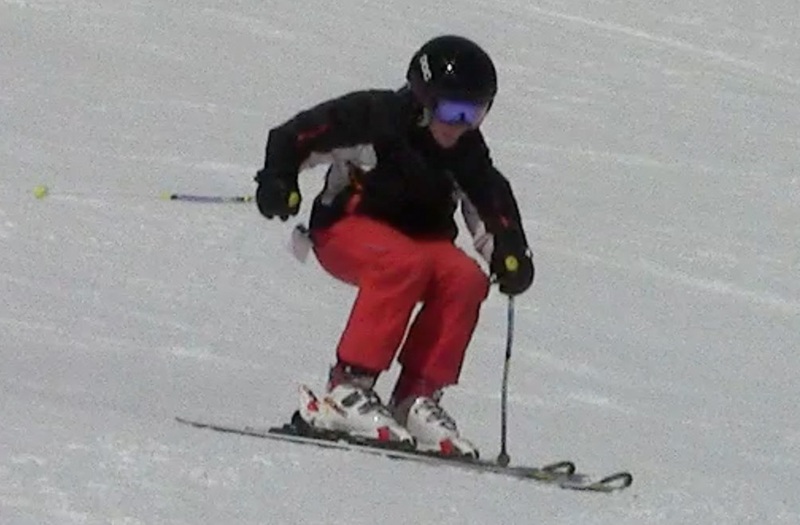 The "flexed release", also referred to as "flexion release", "flex to release", "retraction" or sometimes "down-unweighting", refers to releasing the outside ski by flexing the outside leg. This reduces the weight on the outside edge, allowing it to be released and un-tipped (to flatten the ski), as the turn ends. During transition, both legs are shorter rather than longer, a result of the flexing. The flexing to release will avoid an excessive up and down motion of the body and also, allows the skier to retain maximum control over the skis, by keeping them in contact with the snow and in fact, most releases include some flexing of the outside leg. The opposite release, by extension or hoping up tends to disconnect the skier from the snow and delay engagement in the next turn. 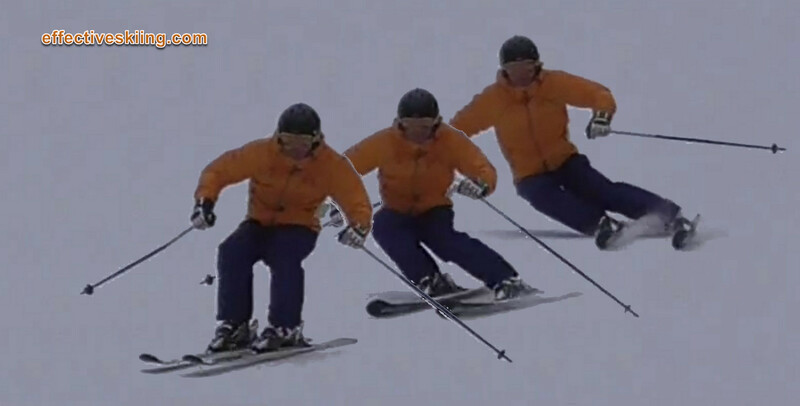 Flexing to release results in a typical low stance during the transition, as you see in the rather extreme example above, which will also result in what seems like a very aft position on the skis, requiring a strong recentering and coiling, like below. Other benefits include establishing early "inclination" into the next turn, as the hips are lower and we don't have to "wait" for the hips to come down, we just extend the legs into the new turn. So, when looking at a skier releasing, it is better to look for extending (longer) legs, or legs that stay the same, or legs that get short (flexing), to determine how the body is impulsed. In the release above, notice how the outside leg is long at the apex and relaxes and becomes short (bent or flexed) when the skis are flat on the snow. There is a range of movements between passively relaxing the legs and allowing the energy of the turn to push the boots up OR gravity to pull the body down. At the other extreme we have a full retraction, where the boots are retracted towards the body. Some of these may be referred to sometimes as "down unweighting" and in the extreme case, retraction release, when there is a strong retraction of the boots. The extreme ranges of flexing or retraction shown here enable high performance skiing, but in reality, the range of flexion will depend on terrain, turn shape etc. As a matter of principle, however, any flexion during the release is better than none and leads to better, smoother skiing. Retraction releases usually interfere with speed control. Speed control when using retraction releases is a higher level skill (we cover that at the black levels). This type of release is also referred to as "down-unweighting" and contrasted to "up-unweighting" aka the extension release, where the hips are pushed "up" to unweight the skis. We prefer the description flex to release because it is very specific as to what the skier does and it does give us a better image as well as a better cue while working on our skiing. Effectively, as you will see throughout this website, flexing and tipping always go together, as you cannot have one without the other. Member-only content avilable (109 words). Viewed 2125 times ( | Print ) this page.